I’m one of the lucky few who can claim to be 14 again and mean it. It happened two Sundays ago. 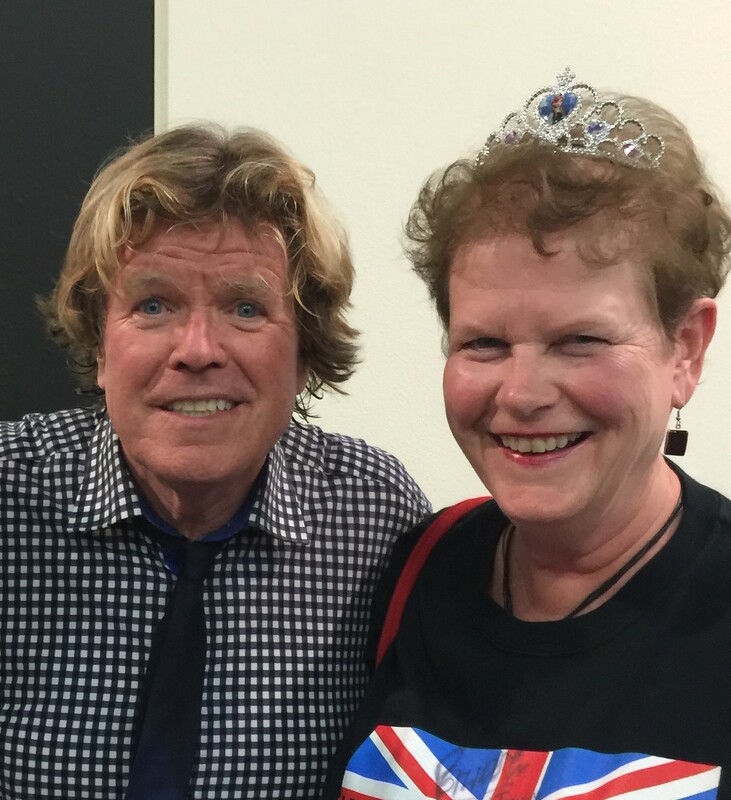 While visiting family near Los Angeles, I had the good fortune to attend a live concert by my teen idol, Peter Noone. And I must say that turning 14 the second time was way more fun than the first. 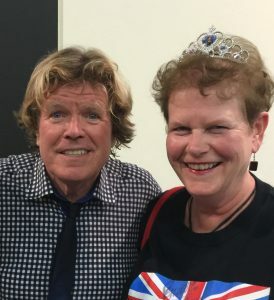 Peter is Herman of Herman’s Hermits, one of the top three bands of the British Invasion. The legendary band outsold the Beatles in 1965 when competitors included the likes of the Rolling Stones, the Beach Boys, the Four Seasons, Gary Lewis & the Playboys , to name a few. While many dismiss the Hermits as lightweights, there’s something about their clean-cut, happy image that has endeared them to fans for more than 50 years. Peter and his current band perform more than 100 concerts a year, and though I’m prejudiced, I must say that he sings “I’m Henry VIII, I Am” and “Mrs. Brown” and “There’ a Kind of Hush” better now than when the songs were first recorded. with homemade Union Jack decorations. I could only dream that I would ever see the band perform, much less meet the lead singer in person. Since then I’ve seen Peter live but every time I have to pinch myself as the photo on the old Herman’s Hermits LP cover comes to life. He’s the star made me swoon in junior high. The one who sang his hits on WLS radio and graced the cover of fan magazines worldwide, Peter was the quintessential teen idol. He was the polite and talented teen-ager who dressed in a suit and tie—the darling of variety shows hosted by Ed Sullivan, Dean Martin and Tom Jones. “So am I the good guy or the bad guy?” Peter said. “Oh you’re the good one!” she gushed. My relatives agree that Peter’s shows are the best way to peel away the years. After all, how can anyone listen to a happy song like “I’m Into Something Good” and not sing along? Some friends think it’s crazy to listen to Sixties music, but we all repeat things we enjoy. Like watching the same ball team, the same TV show, the same movies, the same card game, the same candidates spout the same promises. Fun is as fun does. If we admit it, we all get a charge out of meeting famous people, hoping some stardust will rub off. Peter is one of those gifted Peter Pan sort who can light up a room just by being there. He describes himself as “Panglossian,” meaning a positive-minded person who dwells in a happy place which is no small thing these days. 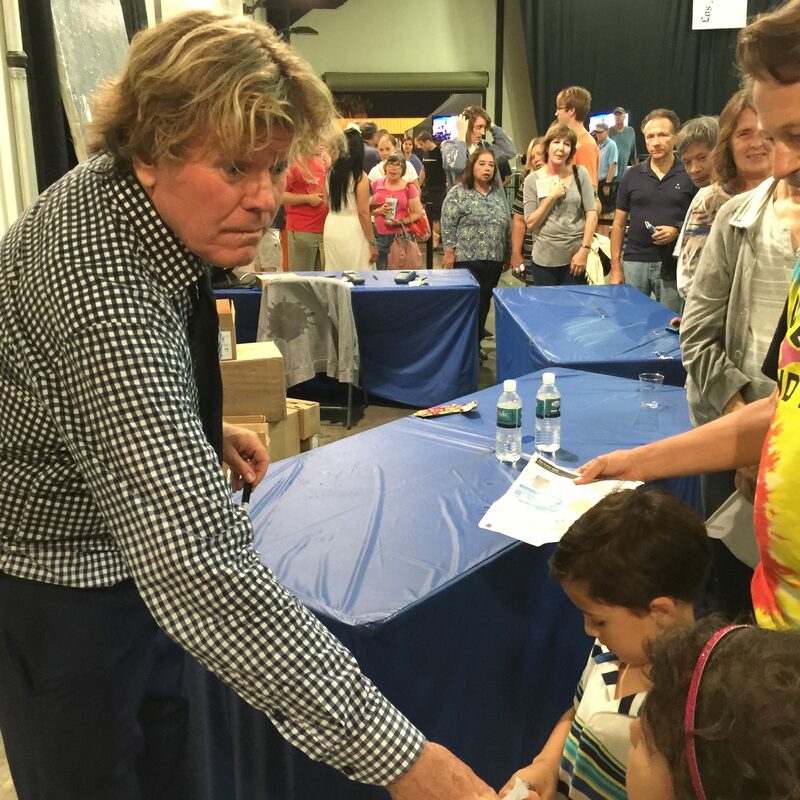 At 68, Peter Noone can sing and dance for 75 minutes in 90-degree heat, fully suited and still sound great. But half the magic is his devotion to fans. 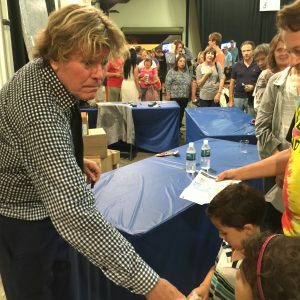 After nearly every show, he greets each person, signs autographs and poses for pictures—all for free. That Sunday evening, the line was more than an hour long. Peter shared laughs with all of us as my cousin’s five-year-old stood bug-eyed, looking up at the star old enough to be his great-grandfather. “Wow! That Peter guy is cool,” the boy said later. I agree. Joyful celebrities don’t come along every day, nor does the chance to become an adolescent again. Turning 14 was way more fun this time around.